Have you ever finished a page and thought it could use just "a bit more of something", but didn't know where to start? That's a great time to look around your scrap room, grab your extra embellishments, ink, pen and bling and start thinking about details. Adding that extra creative flair to your page can be as simple as inking a die cut, or layering your ribbon. 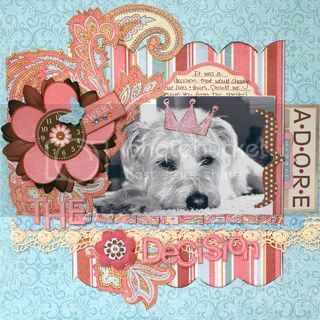 In the layout below I used MME Garden Party Lush Blooms pattern paper and die cuts to create this page about our sweet dog Maddie. Next time you want to add a little extra "something" to your pages, take a second look at your scrapping supplies, and definitely think "details" For more inspiration take a peek at the awesome Ally Scraps Gallery. You can also find the MME Lush Blooms collection and Heidi Swapp felt butterflies & flowers at the Ally Scraps store.